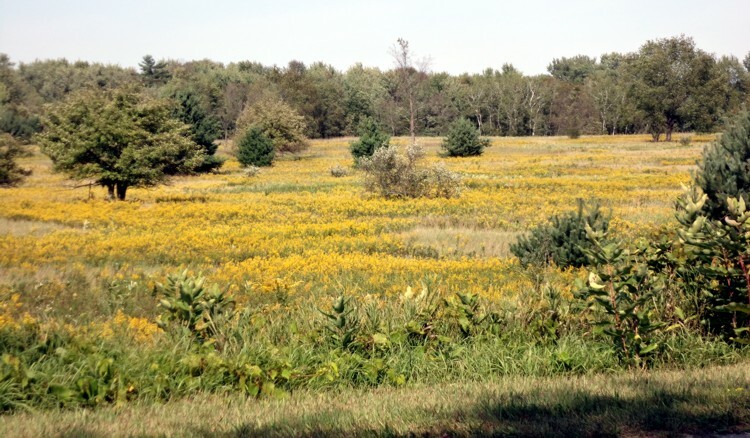 Most open fields in this area and many other parts of the United States look as if touched by Midas as goldenrod blooms in late summer-early autumn. Numerous species of goldenrod are found in Michigan, and even more in North America. Perhaps because of this local abundance, many gardeners don’t consider this plant garden worthy. It is true that most species are lanky and rampant, and invade places readily. In Europe, there are not as many species, and when first imported into England from the Middle East, it was an expensive medicinal herb. Its Latin name of Solidago means to make whole, or heal. Solidago was believed to cure kidney ailments, and a compress relieved the pain of fresh wounds and insect stings. Early herbals list a long litany of ailments goldenrod could cure, including calming the nerves. It also had a sweet taste used to hide more unpalatable medicines. Today, medical research has not proved goldenrod capable of curing anything except maybe blah spirits when someone looks at its cheery plumes of tiny yellow flowers. Goldenrod still has some uses. Weavers use the flower heads for a natural dye. It provides varying tones of yellow depending on how the dye is made. Its dried flower heads provide winter bouquets, keeping their yellow color in a much softer tone. The only other notable use of goldenrod was in 1948, when Texas tried to develop it as an agricultural crop for an ingredient in goldenrod gum and candies. They didn’t succeed. For many years goldenrod suffered an undeserved reputation for causing hay fever. Insects pollinate goldenrod, so its pollen is large and sticky to make it easier to coat the insect body for pollinating the next flower. This makes the pollen heavy and more likely to drop to the ground than become air-borne. I still like mine best in the surrounding fields. 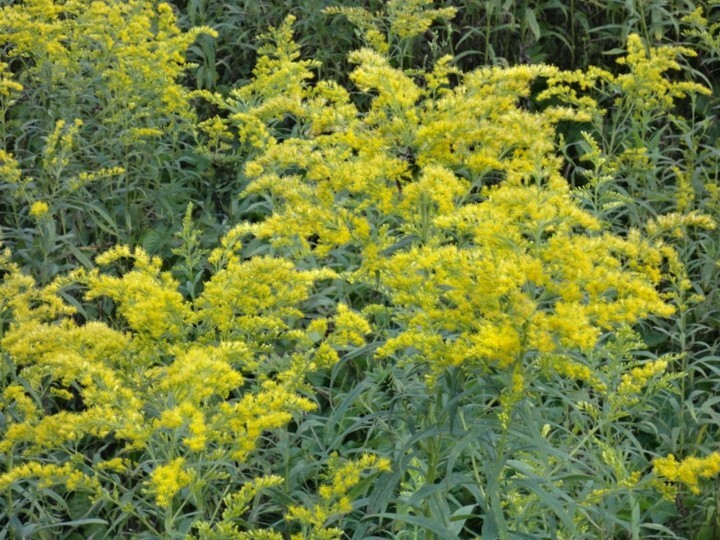 Nice article, great pictures… but Goldenrod is a vitally important Fall forage for honey bees! If we don’t get a good Goldenrod bloom here in Kentucky, we either feed sugar all WInter or lose colonies. Can you tell me the species of Goldenrod that is native to the Mideast? A Turkish beekeeper friend has asked about it. I did not know that, but certainly an important aspect to letting wild goldenrod grow and bloom. Solidago sphacelata, S. altissima (S. canadensis might be the same species, I’m not sure), S. graminifolia, S. speciosa, S. gigantea, and S. odora all grow in Kentucky, but I’m sure there are more. Since goldenrod is your state flower, I’m sure any native plant nurseries will have either plants or seed. The species from the Middle East was a long time ago — Greek and Roman times, so I can’t tell you what species grow there now, but the European species is S. virgaurea. Wikipedia claims it was cultivated in the Arab world.